t the odd or the evens were my two favorite, the placement of this issue doesn't break the pattern. Hooray for that, I think! Let's take a closer look then. This is a 38 page PDF with a lot of the regular authors, there's no particular running theme behind these articles; I just tried for a whole five seconds to name one, but one article is an exception to each of the million I thought up. 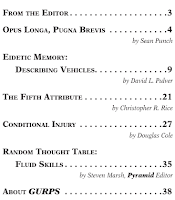 All of the articles work without anything outside the Basic Set, though some have references, like The Fifth Attribute having advice to massage it into existing GURPS lines, or Opus Long, Pugna Brevis referencing some ideas from Action. The long and short of things is that this is an all around pretty good issue, with all the articles being in kind of a B+ to B- range, and when you compare that to the rest of 2018 thus far, that puts it pretty far out in front with one or two others. If you feel like buying it after reading this, I'd not hesitate to recommend that you do. 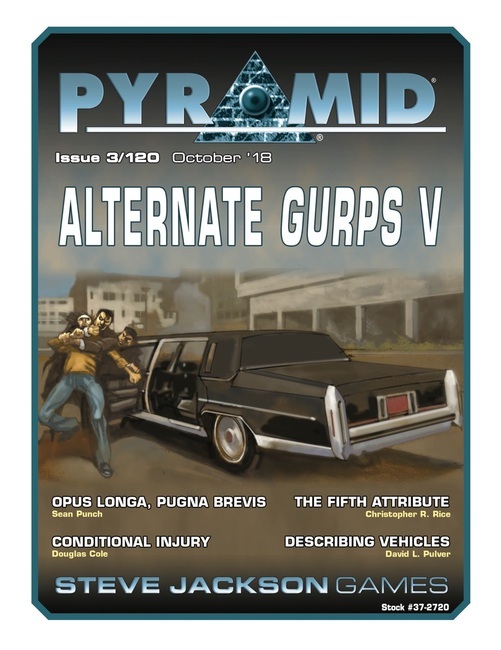 This 5 page article by Sean Punch, is a little bit of a thought experiment on some of the problems for "support classes" in GURPS. 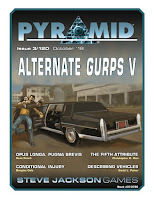 Yeah, GURPS doesn't have "classes," but, you know, you get a party of a cool sword guy, a cool gun guy, a cool brawler guy, and the one that is good with computers, and that's fine, except maybe, the first three have a whole mini-game called combat that is going to require all sorts of tactical thinking and risk taking, and the last guy is going to have a roll against computer programming for his "spotlight scene." This article examines a bunch of ways to make these "roll to do the one thing you do well" moments a little bit more interesting, and make it seem awesome when the computer guy does his thing instead of a kinda inevitable thing that happens between two fights for the other guys. I like that it has a bunch of ideas ranging from pretty simple, to some that actually sound pretty good, albeit, maybe a bit too mechanically detailed. Ah well, maybe I gotta try it out first to be sure. A pretty neat 11 page guide to making decent stats based off real world vehicles, by David L. Pulver. It explains how you go from the spec sheet of a real vehicle to GURPS stats, while doing a side by side demonstration of applying the article to the SR-71 Blackbird. It's not a fully fledged design system to make a vehicle whole cloth, and a few bits are winged, like, for example, Stability Rating, where there is no simple equation, and instead, you are given a table with values of 1 to 6 and asked to choose the one that sounds the closest to the real world stability of the subject. Overall, provided you can get the raw numbers on some real world vehicle, it looks like a pretty straightforward and useful tool. 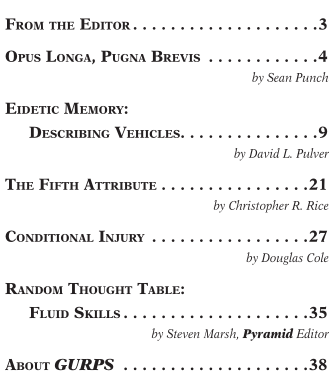 A six page article by Christopher R. Rice on introducing a magic/special attribute called "quintessence" or QN. Interestingly, I had a GM run a game with a similar idea, so the article isn't exactly world changing for me, but it thoughtfully explains a lot of the edge cases and gotchas, some were sticking points in the system that we used. Although the idea is, I can't think of the right word, so let's go with "unsurprising," there are a few neat ideas in asides here and there that are pretty good, and there's a helpful integration guide in the last few pages for some of the popular existent power and magic systems. My one smallish gripe is it seems a bit like it homogenizes special abilities a little bit; someone good at Chi-ish stuff is now good at resisting a Mage; and a Divine based priest likewise resists a martial artist, but I can't think of a good way to go for that either, and a quick brainstorm, all my ideas seem either uncomfortably convoluted, or even more homogenized, so at least I can't think of a better way right now. This is a seven page article by Douglas Cole on replacing the HP system with the wounding system that you might see in some other games. I've seen something similar in Burning Wheel. This can help make a tabletop feel a little less gamey and a little more narrative if that's up your alley. The article goes into some really detailed mechanics, some of them come off feeling a bit laborious from a first glance, but these are at least organized well so that at least the important bits are more up front and the edgey bits are more at the back. It feels like there is a lot of math to do, and a lot of new equations to internalize, but I'll chalk that up as what happens when you take a fundamental mechanic like HP out of a game that that used it as a cornerstone, and have to figure out balanced applications for all the subsystems that interacted with such a fundamental building block. Regardless of my wary impressions, I'm kinda interested to see how it would work out in play. Perhaps after a short amount of playtime, the mechanics are easily enough internalized . I'll find out one day, maybe. A three page, unusually long installment from Steven Marsh, speaking to how some characters have good and bad days, and though I usually like Random Thought Table, and I really like this issue, this is probably the one article furthest in the realm of "huh" and "why?" for me. The idea is that some heroes in popular fiction can be really awesome at some things sometimes, and then flub it at other times, and sometimes flip flopping as the plot demands it. I don't have any problems with the premise, but the mechanical execution however seems a bit... out of control? There's very little input into these fluctuations from the player or the GM than whether the skill was applied or not, and the degree of variability seems a bit too constrained, it seems like at most, in the power level of the campaigns I run, a character would get a very occasional small bonus to a skill, and probably lose said bonus pretty quickly. I think it needs a lot more careful thought to be more than a bookkeeping slog that rarely gives and takes + or - ones.